Beyond the meal: Where does your food come from? 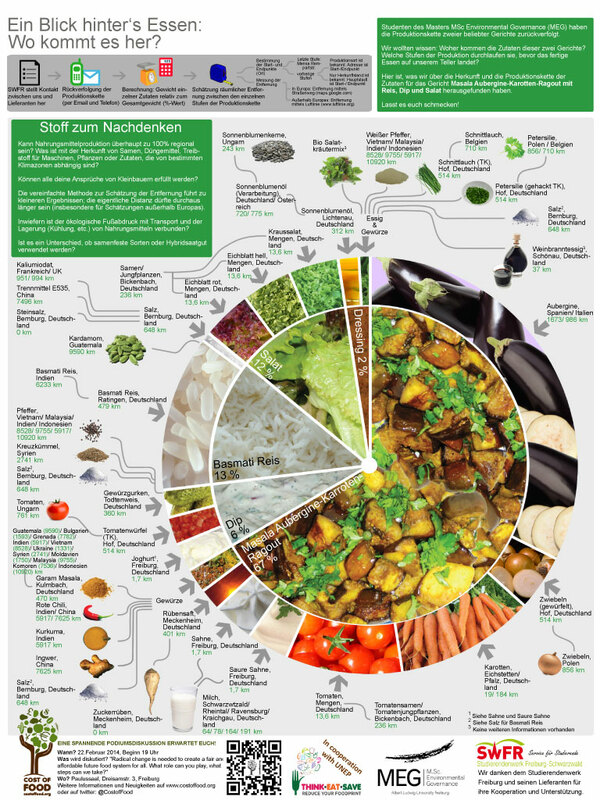 In cooperation with the „Studierendenwerk Freiburg“ (SWFR) students of the Master program Environmental Governance (MEG) created an overview of the production chains of two Mensa meals. 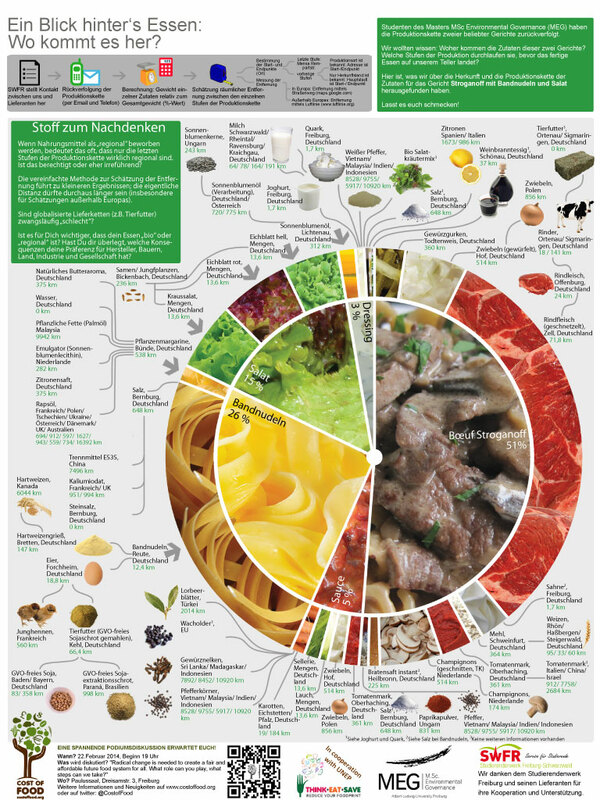 The resulting infographics are presented on large-scale posters in the Mensa I (Rempartstr. 18, Freiburg) and Mensa II (Stefan-Meier-Str. 28, Freiburg) and will remain on display for the remainder of 2014. 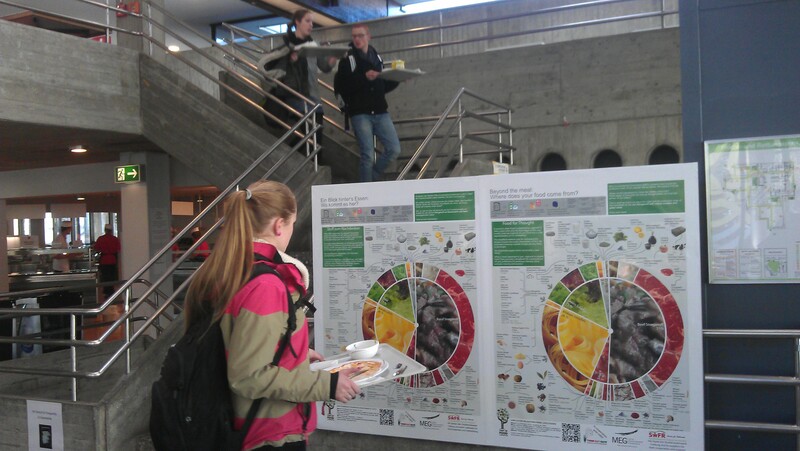 Every day thousands of Freiburg’s students have lunch in the mensas of the „Studierendenwerk Freiburg“ (SWFR). They might only have short look at the meal on their plate before they start eating. However, where do the ingredients come from? What stages of production do they go through before the prepared meal arrives on the plate? These are two questions the students of the Master Environmental Governance (MEG) asked themselves. To get the answers they traced back the production chains of two popular Mensa meals. Where do the ingredients for the dish Stroganoff with ribbon noodles and salad or the dish Masala-aubergine-carrots-ragout with rice, dip and salad come from? The research process began in July 2013 and culminated in the creation of posters to visually illustrate our findings. The support of the SWFR and its suppliers contributed significantly to the success of this project. Enjoy the food for thought!